I have always been fascinated by early photographs taken during the pioneering years in the nineteenth century… the images are so mysterious and beautiful – literally memories of a moment held in captured light and chemical wizardry. 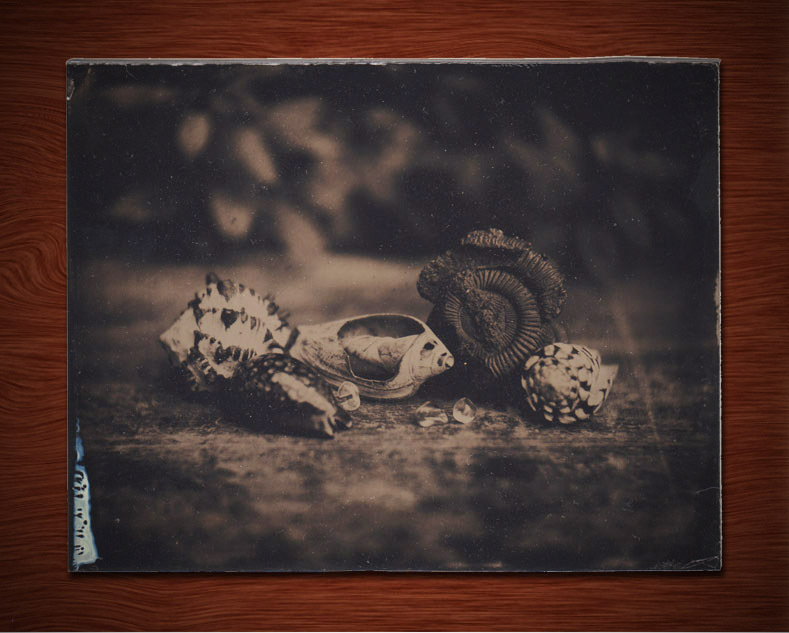 Photograph of shells and fossils, wet-plate collodion on glass, taken by me at the workshop. I am a little intimidated by the complexity and precision of pre-digital photographic processes, yet I find myself regularly drawn in out of sheer curiosity. Melanie King, one of my former classmates at Central Saint Martin’s, has devoted her practice to exploring historical and experimental photographic techniques. She introduced me to Sebastian Sussmann’s Double Negative Darkroom in Hackney, which hosts regular meetings of Melanie’s London Alternative Photography Collective, as well as workshops in a wide range of processes. 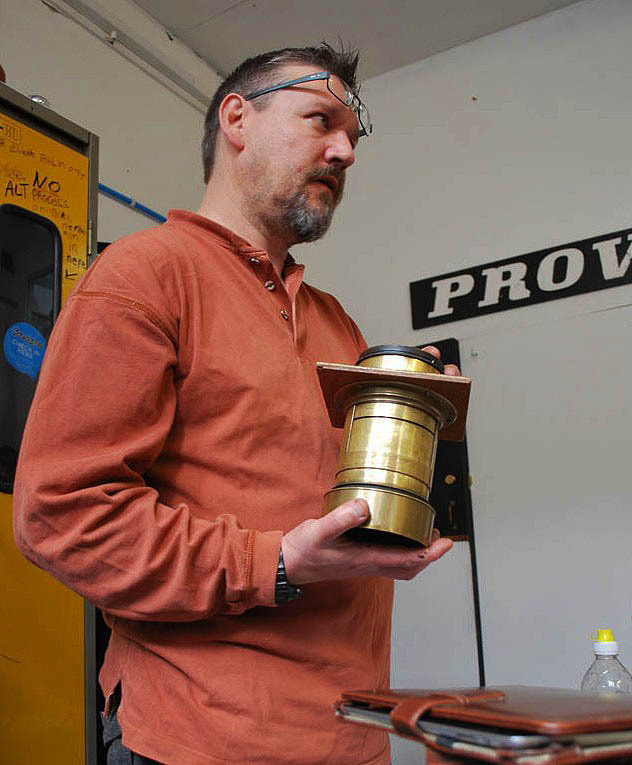 One that I absolutely had to attend was John Brewer’s Wet-Plate Collodion workshop. John Brewer is a Manchester based photographer who specializes in historical photographic techniques. 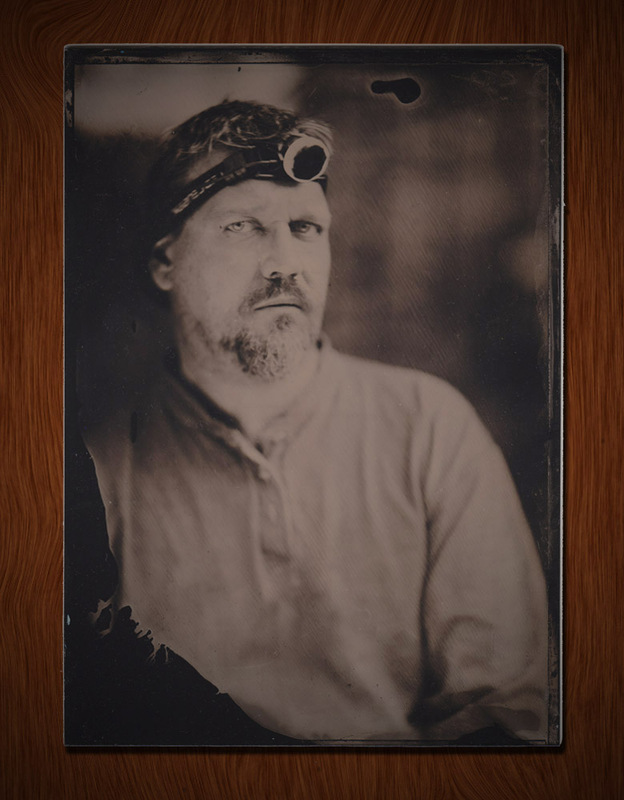 The wet-plate collodion process was launched in 1851 by its inventor, Frederick Scott-Archer. Coinciding with the Great Exhibition at Crystal Palace, the process rapidly replaced the early Daguerreotype and Fox Talbot Calotype processes, initiating the rise of the professional photographer. Collodion is a liquid chemical made of gun cotton (nitrocellulose) dissolved in ethanol and ether, which when dry creates a plastic and highly flammable cellulose film. During the photographic process it must not be allowed to dry – hence the term “wet-plate”. Working in the darkroom, a glass plate is flooded with the collodion, then immersed into a silver-nitrate bath to sensitize it. Once the plate comes out of the silver-nitrate bath you have to work fast, as you need to take the picture and develop it before it begins to dry. We installed our plates in the beautiful mahogany plate-holders that fit into John’s collection of fine antique box cameras, which we had the privilege of using to take our pictures. The exposures for this process are quite long – several seconds – which is why, when you take a portrait, you need to secure your sitter’s head in a metal brace from the back! Nineteenth century cameras had no shutters, so once you have exposed the plate for the required time, you simply cover the lens in front with a bowler hat while you slide the plate-holder closed again. Then you take it out and make a dash for the darkroom to develop and fix the image. John Brewer very kindly sat for the portrait I took. He explained that one of the reasons for the slightly ghostly aspect of Victorian portraits is that the plate is sensitive to light waves that start somewhere in the middle of the visible range – i.e. green – and extend to the ultra violets which we do not see. This accounts for the zombie-paleness of normal blue eyes like John’s, and the complete black-out of anything in the red range, like the red lamp on his head..
A glass plate can be used as a negative to reproduce a picture as many times as desired – hence the importance of the wet collodion process in spearheading the industrialization of photography. 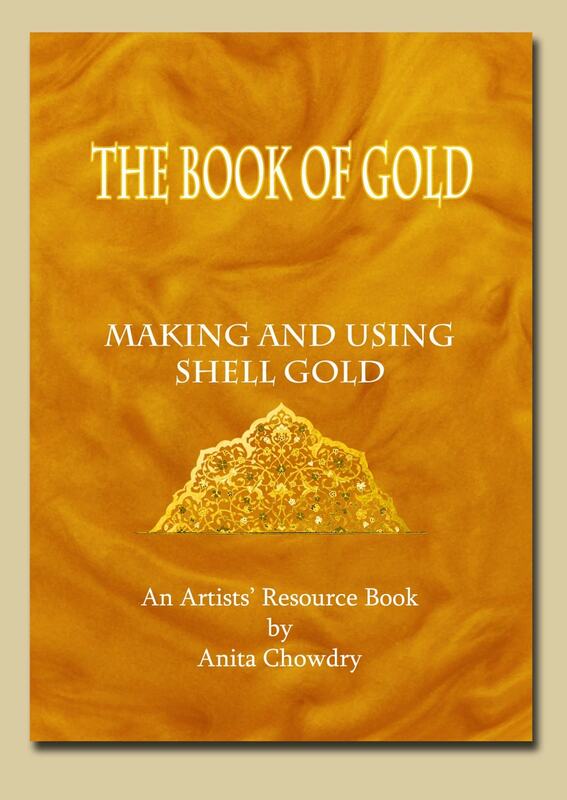 Alternatively it can be sprayed at the back with black paint, which makes it into a one-off positive image. 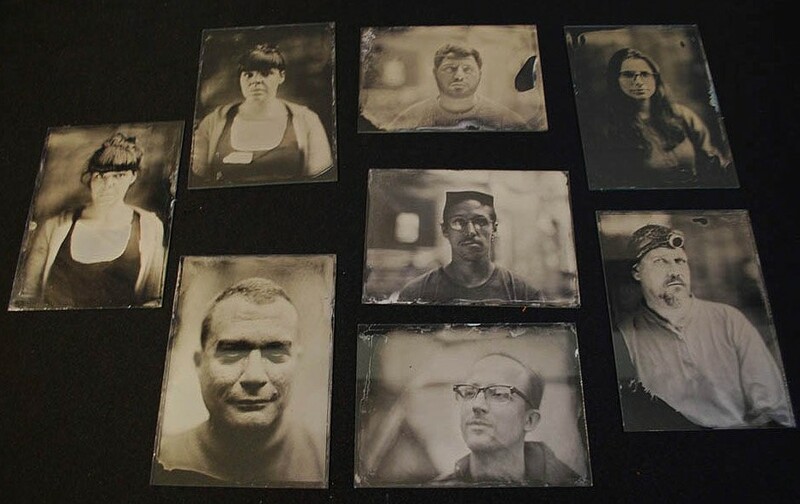 We also used the process to create positive images on metal plates, called Tintypes. All of the photographs have to be carefully varnished on the surface, as the image is actually very delicate. By the end of the weekend workshop I think all of us were rather proud of our efforts, displayed below. 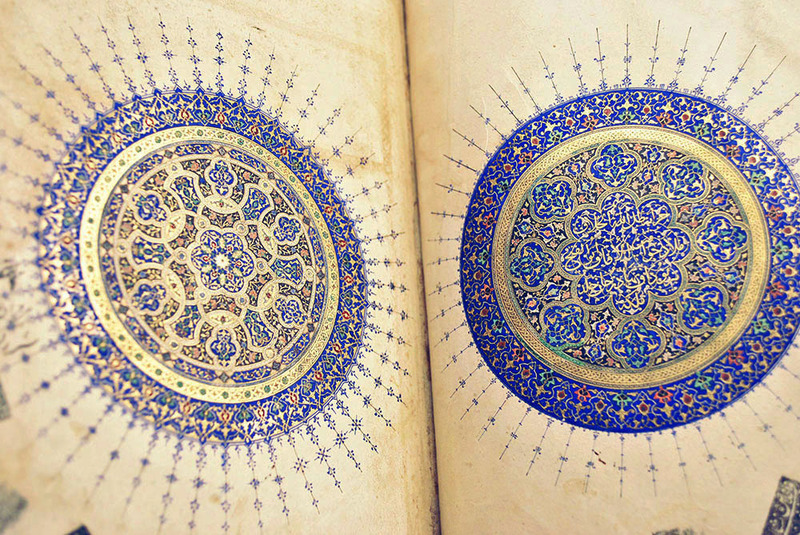 ← Ingenious Machines Part 2: Harmonic Vibrations and Messrs. Newton & Co. Yes – it is interesting to realize just how much of that character was a result of the photographic process!